Former World Series of Poker champion turned business consultant Annie Duke teaches you how to get comfortable with uncertainty and make better decisions as a result. By shifting your thinking from a need for certainty to a goal of accurately assessing what you know and what you don’t, you’ll be less vulnerable to reactive emotions, knee-jerk biases, and destructive habits in your decision making. The key to long-term success is to think in bets. The notion of a business planning book written by a former World Series of Poker champion would seem to imply that most business plans represent a crap shoot. 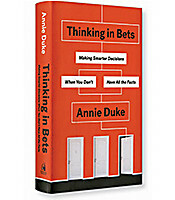 Anne Duke’s book, Thinking in Bets: Making Smarter Decisions When You Don’t Have All the Facts, presents a convincing argument that business leaders can learn a lot from an evaluation of the “facts, choices and probabilities” that go into a single poker bet. 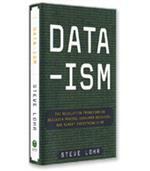 Companies spend millions of dollars annually to collect, analyze and forecast data in the pursuit of certainty. The more perceived certainty in their data, the greater the confidence in their decisions. These data-driven decisions may offer reassurance, but if we consider the definition of a bet, that reassurance may be overstated. The analogy of business as a game of chess is equally reassuring –– a clearly identified opponent, following predetermined rules, towards a zero-sum outcome. Somebody wins, somebody loses. This may work in theory, but in reality there are too many variables at play for a business environment to be so uniform in its design. Since decisions are reviewed in hindsight, leaders inevitably fall victim to “Monday morning quarterbacking” or Duke’s preferred poker term: “resulting.” In this context, the quality of any decision is determined by the success of the outcome. A “Hail Mary” pass in the final minutes of a close football game can be a stroke of genius if it works or the craziest decision a coach ever made if it doesn’t. The author’s issue here is that the quality of a decision should be judged on the available data at the time, not the outcome. A decision can be a good one and still not have a positive outcome because there is an inherent risk in every decision. This problem then gets further compounded when leaders incorporate the “wrong” decision as a done deal in the next planning cycle –– “let’s make sure we don’t do that again” –– rather than treating the outcome as feedback for further discussion and analysis. Poker bets are made by individual players, but Duke argues that any poker game can fall victim to the same risks of homogeneity or “confirmatory thought” as any business in the absence of diversity. The odds don’t favor a player who places a bet to confirm his hunch about the next card, just as the chances of success for a new initiative are reduced if the leader only surrounds herself with yes-men. Communism: Data should belong to the group. Universalism: Apply uniform standards to claims and evidence, regardless of where they came from. Disinterestedness: Vigilance against potential conflicts that can influence the group’s evaluation. Organizational Skepticism: Discussion among the group to encourage engagement and dissent. Thinking in Bets takes a very inventive approach to smarter decision-making. Using such diverse examples as Seattle Seahawks coach Pete Carroll, Supreme Court Justice Clarence Thomas and the classic sitcom WKRP in Cincinnati, Duke demonstrates how the mechanics of a single poker bet can be applied to the strategic planning process. By pursuing objectivity rather than certainty, it is possible to overcome our proven tendencies toward making “hunches” and “gut checks,” and to focus on the quality of the data rather than the success of the outcome.